public works is a London based art and architecture practice whose members and partners have been collaborating in different constellations since 1998.
public works projects include participatory public realm design schemes, interdisciplinary debate and publications. All public works projects address the question how users of public space are engaging with their environment and how design and programmatic strategies can support and facilitate physical, economical and social infrastructures in the public realm, both in urban and rural settings. Join us for the public programme of our two week Summer School, Prototyping the Civic City. Through a series of field-trips, workshops, talks and events we will be exploring how artist, design and activist practices can empower citizens to remake, rethink and re-imagine the city. We will be focusing on how 'civic action' can allow participants to develop new skills, strategies and practices to directly affect changes in the city. Core to this is the idea of prototyping open source designs and rethinking organisational structures. 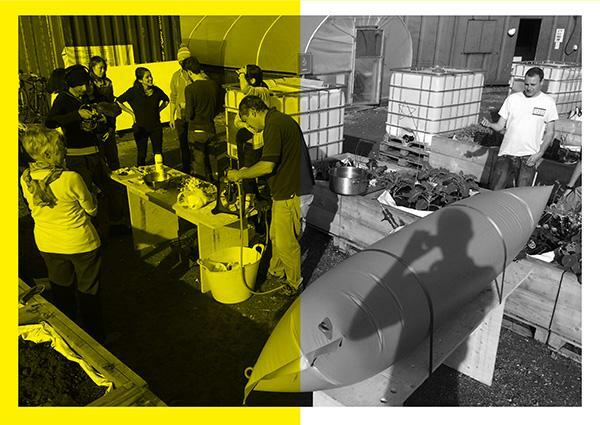 Join us in building, making, testing new prototypes for civic action. We'll be focussing on three different kinds of green infrastructure which address air quality, food waste and off-grid cooking. Come lend a hand or your knowledge. The School of Civic Action in collaboration with Commons Rising are inviting commons initiatives and commoners to come together to initiate a UK wide Commons Assembly. This is an open platform to meet others, exchange knowledge and to see if there is an appetite for an ongoing UK Commons Assembly. This one-day symposium curated by Sol Perez-Martinez of the Spatial Engagement Network, will explore ways to engage critically with our urban environment. Throughout three sessions participants will discuss spaces and methods proposed to foster meaningful relations between people and the places where they live. Ideas for Civic Action, will bring together practitioners, researchers and community groups who have worked connecting people with their surroundings in order to share practices and discuss further action. The event will showcase initiatives where architects have been aware of the social and political implications of their work, aiming to encourage a more conscious way of practice which serves community interests. Following the symposium, a final shared event in collaboration with Just Space, public works and Umeå School of Architecture, will discuss current projects where communities across London are taking action over their local areas and will draw conclusions from the day's parallel events. Pedagogies of the temporary. - Archives, Schools and the Temporary City. Join us for an afternoon session drawing a line of thought between archival practices and learning formats inspired by temporary use projects.Four speakers will present ideas, archives or projects opening up a view on the alternative learning spaces offered by temporary use projects and how this learning can be captured, passed on and mobilised in other forums.Taking as a point of departure the School of Civic Actions collaboration with Roskilde Festival, Northern Europe's largest annual music festival and for one week every year, Denmark's fourth largest city. Bringing the summer school to a close on site at R-Urban Poplar, we'll be exhibiting all the prototypes built and tested over the previous week. Join our students in celebrating the schools hard work over a collective meal and reflective discussion. The School of Civic Action is a pedagogical experiment that tests situated modes of learning in support of civic city making, while challenging traditional urban teaching and disciplinary restriction. The School maneuvers across disciplines that complement one another, implementing new ways of knowing and acting. Teaching and learning at the school is symbiotic; by situating its curriculum within live projects, it can mutually provide a support structure back to the local communities, the sites they occupy and for the individuals enrolled. This outing of the School of Civic Action is with the support of; public works, Umeå School of Architecture, Tate Exchange, Roskilde Festival, R-Urban Poplar, Spatial Engagement Network and Just Space. The School of Civic Action is hosting a two week summer school in London, at Tate Exchange and R-Urban Poplar. Under the theme of 'Prototyping the Civic City' we'll explore how artist, design and activist practices can empower citizens to remake the city. The schools curriculum is centred around ideas of 'civic action' allowing participants to develop new skills, strategies and practices to directly affect changes in the city. Core to this is the idea of prototyping open source designs and rethinking organisational structures. The summer school draws on two test sites; firstly at R-Urban Poplar in East London where we will build prototypes in support of local actions for environmental change such as air quality, food waste and sustainable energy production. In parallel we will transform the space at Tate exchange on the 5th floor of Tate Modern into a public classroom which brings together activists and practitioners engaged in civic movements (UK Commoners Network, Just Space, Spatial Engagement Network, Umeå School of Architecture). The summer school itself prototyping a collective education platform for civic action, through the building of new networks which share situated and expert knowledge with the public. We are offering 10 free places for people to join us starting on the 13 July and concluding on the 25 July 2018. The summer school will take place in it's entirety in London, places on the school are for free but food and accomodation is to be organised by school participants. The invitation is open to all disciplines and backgrounds, professional or amateur we strongly encourage members from voluntary groups across London to apply. The Summer School is free of charge. In return we expect participants to be committed to the full programme and enthusiastic learners. Teaching on the course will be made up of a mixture of hands on building and making, alongside discursive seminars, workshops and events. Time will be split evenly between our site R-Urban Poplar (E14 0SP) and the Tate Exchange (SE1 9TG). To apply please send no more than a 500-word proposal to public works laying out your specific interest in joining the Summer School and if appropriate relevant samples of previous work (no more than five A4 pages), along with a short CV with key information about yourself. School of Civic Action is a pedagogical experiment that tests situated modes of learning in support of civic city making, while challenging traditional urban teaching and disciplinary restriction. The School of Civic Action manoeuvres across disciplines that complement one another, implementing new ways of knowing and acting. Teaching and learning at the school is symbiotic; by situating its curriculum within live projects, it can mutually provide a support structure back to the local communities, the sites they occupy and for the individuals enrolled. R-Urban Poplar is a community facility to support local groups and promote the ethos of re-use and environmental friendly approaches to city living. It offers drop in sessions and expert lead workshops around urban-agriculture, food, wellbeing, local energy production and making. The School of Civic Action at Roskilde Festival is a ten-day long summer school hosted by public works with Roskilde Festival which explores ideas around temporary use and the making of the instant city. The school is conceived as a three-year long programme which will lead up to an international conference and publication and critically reflect Roskilde's contribution to the wider discourse on temporary use and city making. This will also conclude and coincide with the 50th anniversary of the festival in 2020. The first year of the summer school focuses on the unique knowledge produced by the festival over the last 48 years in constructing and refining the temporary city. Under the theme of 'Temporary Commons' we will bring together students, practitioners and academics to explore shared practices and concerns around the notion of temporary use set against the backdrop of Northern Europe's largest annual music festival. We will explore the festival's capacity to promote new forms of living and examine how temporality can be understood as a strength enabling us to gain new knowledges and methods to help us shape the way we live beyond the duration of the festival. 1 - The first outing of the school is focused on understanding the festival from the inside out. 2 - The second iteration in 2019 will be dedicated to the large international networks created by the festival which carry the culture of temporary use across the globe. 3 - The third and final summer school in 2020, together with the publication and conference will help to reassert temporary use as a positive force to promote the values and ethos of Roskilde Festival at large. The Summer School will take place on the festival site in the week before doors open to the public, while all the venues for Scandinavia's largest temporary city are being constructed. Together we will design and construct components for Scandinavia's largest temporary city and host open fabrication workshops during the first three days of the festival. The hands-on workshops will be accompanied by reflective seminars, lectures and discussions exploring the role of temporary use in today's city making through the eyes of various disciplines such as art, engineering, curating, architecture and geography. The result of the workshop will be captured in a contribution to a week long programme hosted by The School of Civic Action at Tate Exchange in London in July 2018. We are offering 15 places for people to join us starting on the 25 June and concluding on the 4 July 2018. We will live at Roskilde festival where the summer school will run alongside the construction of the festival, culminating in the first three days of the festival before the music starts and the festival reaches its full capacity. The invitation is open to all disciplines and backgrounds, professional or amateur. The Summer School is free of charge along with tickets to the festival itself. In return we expect participants to become hosts during the three days when the festival gets under way and opens its doors to the wider audience of festival goers. You will need to cover all your travel and food costs and provide your own camping equipment. The School of Civic Action is a pedagogical experiment that tests situated modes of learning in support of civic city making, while challenging traditional urban teaching and disciplinary restriction. The School of Civic Action maneuvers across disciplines that complement one another, implementing new ways of knowing and acting. Teaching and learning at the school is symbiotic; by situating its curriculum within live projects, it can mutually provide a support structure back to the local communities, the sites they occupy and for the individuals enrolled. Please join us for a special Friday Session (on a Thursday) at Central Saint Martins College of Art and Design for an evening symposium celebrating the launch of 'The Social Re-Production of Architecture'. The Social (Re)Production of Architecture brings the debates of the 'right to the city' into today's context of ecological, economic and social crises. Building on the 1970s' discussions about the 'production of space', which French sociologist Henri Lefebvre considered a civic right, the authors question who has the right to make space, and explore the kinds of relations that are produced in the process. In the emerging post-capitalist era, this book addresses urgent social and ecological imperatives for change and opens up questions around architecture's engagement with new forms of organization and practice. The book asks what (new) kinds of 'social' can architecture (re)produce, and what kinds of politics, values and actions are needed. Doina Petrescu is Professor of Architecture and Design Activism at the University of Sheffield. She is co-founder, together with Constantin Petcou, of atelier d'architecture autogérée (aaa), a collective platform conducting explorations, actions and research concerning participative architecture, resilience and cities co-produced transformation. Recent projects include R-Urban, a participative strategy for local resilience in the Parisian Region and WikiVillage Factory, a cluster for social and ecological innovation in Paris. These projects have received international recognition and numerous awards across the years including the Innovation in Politics for 'Ecology' EU Award (2017) Zumtobel Award (2012), the Curry Stone Prize (2011) and the European Public Space Prize (2010). Her publications include R-Urban Act: A Participative Strategy of Urban Resilience (2015), Agency: Working with Uncertain Architectures (2009), Trans-Local Act: Cultural Politics Within and Beyond (2009), Altering Practices: Feminist Politics and Poetics of Space (2007), Urban/ACT: A Handbook for Alternative Practice (2007) and Architecture and Participation (2005). Kim Trogal is a lecturer at the Canterbury School of Architecture, University for the Creative Arts. She completed her architectural studies at the University of Sheffield, including a PhD in Architecture (2012) for which she was awarded the RIBA LKE Ozolins Studentship. She was Postdoctoral Researcher at Central Saint Martins, University of the Arts London (2014-2016) and research assistant for the Building Local Resilience platform at the Sheffield School of Architecture (2012-2015), exploring issues of local social and ecological resilience. Kim is currently collaborating with critical management scholar Valeria Graziano on the politics of 'repair and maintenance' across different collective practices. Together they are co-authors of 'The Politics of Collective Repair. Examining object-relations in a Postwork Society,' which appeared in Cultural Studies in March 2017 and co-editors of Repair Matters, a special issue of ephemera - theory & politics in organization (forthcoming). Michael Smythe is the Creative Director of Nomad Projects, an independent commissioning foundation. Nomad Projects mission is to develop socially relevant work within the public realm through cross-disciplinary collaboration, experimentation and action-based research. There is no fixed period for a 'commission' to be realised, allowing artists to develop progressive and original contemporary art at a pace determined by the nature of each project. In 2014 Nomad Projects launched 'Phytology', an urban physic garden & cultural institute located within a disused WW2 bomb-site. Phytology is an artist & community-led project exploring the use & value of wildness within urban ecosystems through research in the arts, ecology & education.In addition to Nomad Projects Michael Smythe has worked with a range of organisations such as Bow Arts, Vinyl Factory, The Old Vic Theatre, Artangel, Siobhan Davies Dance, Grizedale Arts & Punchdrunk. Nasser Golzari and Yara Sharif are practising architects and academics. Both teach at Oxford Brookes University as well as the University of Westminster, London. Having lived and worked in conflict zones, they developed a special interest in the subject of cultural identity, politics and responsive architecture. They mainly look at design as a means to facilitate and empower communities. Combining practice with research, they co-founded the Palestinian Regeneration Team (PART), which aims to explore creative and responsive spatial practices that can heal the fractured landscape of Palestine. Their work, with both their architecture practice NG Architects and with PART, has been published widely, Sharif has been granted the 2013 commendation award - RIBA's President Award for Research for Outstanding PhD Thesis. Their collaborative work with Riwaq on the historic centre of Birzeit won the 2013 Aga Khan Award for Architecture, while the revitalisation of the historic centre of Beit Iksa won the 2014 Holcim Award for Sustainable Construction. Our London team is made up of two new and interesting partners; Javier Rojo is representing the private sector via his waste management company Quantum Waste, Danny Tompkins is representing the 'public' sector through his work for Poplar Harca, and Andy Belfield is representing public works on behalf of the cultural sector. Over the next 18 months the team will seek to deliver an Anaerobic Digester and community cafe as part of a future community garden in Poplar, East London. The core aim of the project is about finding ways that local organic food waste can be broken down into bio-gas and fertiliser - reducing the amount of food waste going into landfill whilst providing energy to run a small community kitchen. The long term goal is the alter and change attitudes towards waste, and provide new economies to support local groups using the future garden.